This "Historically Speaking" column was published in the Exeter News-Letter on Friday, April 27, 2018. Standing like a line of sentinels in downtown Exeter, the three Federal-style homes that face the bandstand on Front Street have preserved the character of the downtown since the 19th century. The oldest of the three, the Sullivan-Sleeper House, is over 200 years old. The house was built in 1809 for George Sullivan. Sullivan, who was born in Durham in 1771, entered Phillips Exeter Academy in 1783 – the first year the school was taking students. He went on to Harvard and returned to Exeter to practice law and pursue politics. The county courthouse, during Sullivan’s day, was located in the middle of Front Street roughly where the bandstand stands now. His short commute to work, however, didn’t last long. Sullivan served as the state attorney general for four terms, was elected to the New Hampshire General Court and Senate and, later, the U.S. Congress. Although these positions often took him away from Exeter, he considered the Front Street house his home. Sullivan died in 1838, and the house changed hands a few times. In the 1850s, the Squamscott Hotel on the corner of Front and Court Streets suffered a fire. Abraham P. Blake leased the Sullivan House and it became the Squamscott during the year it took for repairs to be made. The earliest known photograph of the Sullivan-Sleeper House has a large “Squamscott” sign affixed to the front of the building. Otis Sleeper came to Exeter in the late 1870s and purchased the house on Front Street in 1889. He added the jewelry shop seven years later. Sleeper’s Jewelry was well-known in town for over sixty years, specializing in fine jewelry, watches and an optics department. Otis Sleeper and his wife, Emma Hobbs Sleeper, raised four sons in the house, one of whom, Almon, would carry on the family business becoming manager of Sleeper’s Jewelry in 1924. In 1970, the house faced destruction. Mobil Oil, which owned the lot next door, had plans to purchase the property and intended to raze the house. Percy Rogers recalled, “In several meetings with Emma Sleeper Crowe we discovered that although Mobil Corporation had taken out an action to buy Sleeper no down-payment had been made.” A meeting of the Exeter Historical Society Corporation (then the executive branch of the organization) was hastily summoned and they decided to buy the option to save the house. Through hard physical work and a great deal of financial arm-twisting, the Sullivan-Sleeper house was converted into apartment space and re-sold with preservation restrictions built in. 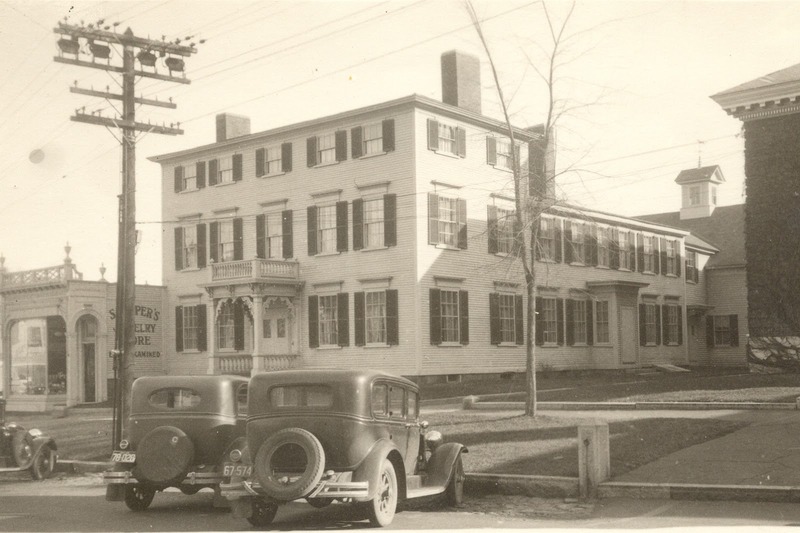 Today, it is a beautiful bed and breakfast called “Inn by the Bandstand.” Guests are served meals in Otis Sleeper’s dining room and can stay in any of the inn’s nine rooms – many of which have a stunning view of Exeter’s downtown. Barbara Rimkunas is curator of the Exeter Historical Society. Her column appears every other week. Support our local history by becoming a member today! Becoming a member is simple – just go to our website: www.exeterhistory.org. Image: The Sullivan-Sleeper house – one of the Federal Sentinels of Front Street – as seen c. 1930.